A Metro Blue Line train at Pico Station. Photo by Andrew Hart via Flickr Creative Commons. Due to track improvement work, Blue Line trains will run every 20 minutes between downtown Los Angeles and Long Beach after 7 p.m. on Friday, May 23. The work will require trains to share one track between Vernon and Florence Station. This means all serving the Vernon, Slauson and Florence stations will board on the Long Beach-bound side of the platform. Plan your trip this Friday evening with Blue Line departure times from 7th Street/Metro Center and Downtown Long Beach Station on Metro’s Service Advisories page. Please note these times may be subject to work-related delays. 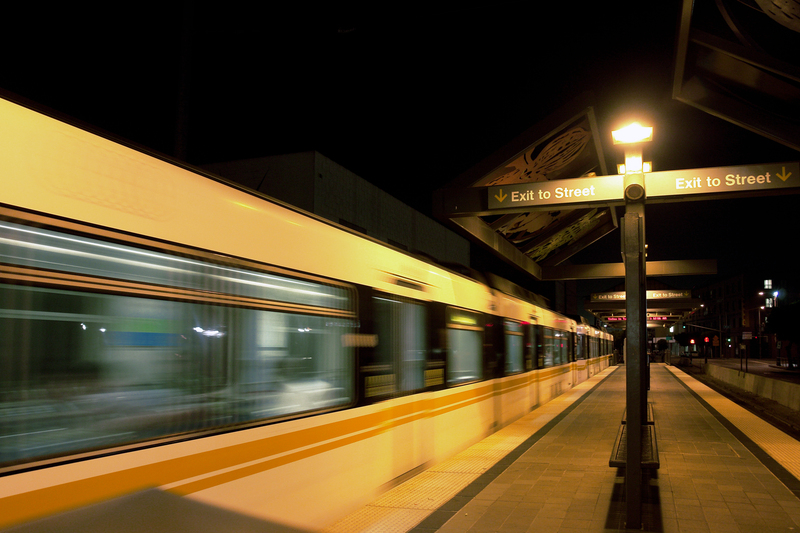 For up-to-the-minute rail alerts, follow Metro on Twitter @metrolosangeles or @metrolaalerts. Regular service will resume with the start of service on Saturday morning. In January 2013, Metro announced a $1.2 billion overhaul for the Metro Blue Line, and this Friday’s track improvement work is part of that effort. Crews will be refurbishing an existing crossover so that trains can safely switch from one track to another. To get a sense of the many aspects of the Blue Line overhaul, click here or check the Blue Line Upgrades page. Thank you for your patience as Metro works to improve the line. Idea for an even Better Blue Line: enforce the rules against vending, panhandling, and loud music. Or the MTA could charge sell vendor’s licenses. I maybe wrong but it seems to me that the Blue Line was not built to standard gauge but instead a gauge used in Japan. This means all the equipment purchased after the Blue Line can not be operated on Blue Line Tracks. I.E. Green Line, Gold Line. But Blue Line equipment can be run on Green Line and Expo Line tracks. Is the gauge being adjusted to the U.S. standard norm? At this rate, we might as well revert to the old 20 minute schedule permanently, if it will allow work to get done sooner. With at least one rail line, and often times multiple ones, running 20 minutes despite the “every 10 minutes after 8 PM” posters that (used) to be present, the schedule is a joke.